In shady woods on summer days. 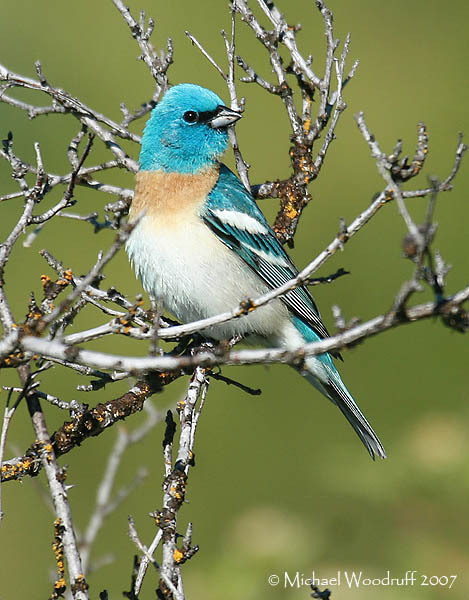 N Colorado and Arizona the Lazuli Painted Finch, as it is called, is common, while in California it is very abundant, being, in fact, generally distributed throughout the west, and along the Pacific Coast it is found as far north as Puget Sound, during the summer. 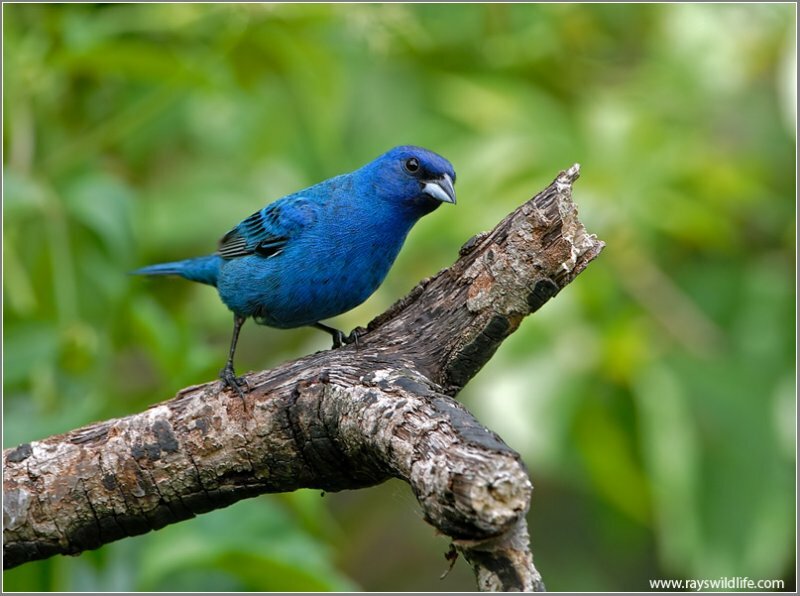 Davie says it replaces the Indigo Bunting, (See Birds, The Indigo Bunting) from the Plains to the Pacific, being found in all suitable localities. The nest is usually built in a bush or in the lower limbs of trees, a few feet from the ground. Fine strips of bark, small twigs, grasses, and hair are used in preparing it for the four tiny, light bluish-green eggs, which readily fade when exposed to light. The eggs so closely resemble those of the Bluebird as not to be distinguishable with certainty. The nest is an inartistic one for a bird of gay plumage. “While waiting for the Woodpeckers, one day, I saw a small brownish bird flying busily back and forth to some green weeds. She was joined by her mate, a handsome blue Lazuli Bunting, even more beautiful than our lovely Indigo, and he flew beside her full of life and joy. He lit on the side of a cockle stem, and on the instant caught sight of me. Alas! he seemed suddenly turned to stone. He held onto that stalk as if his little legs had been bars of iron and I a devouring monster. When he had collected his wits enough to fly off, instead of the careless gay flight with which he had come out through the open air, he timidly kept low within the cockle field, making a circuitous way through the high stalks. He could be afraid of me if he liked, I thought, for after a certain amount of suspicion, an innocent person gets resentful; at any rate I was going to see that nest. Creeping up cautiously when the mother bird was away, so as not to scare her, and carefully parting the mallows, I looked in. Yes, there it was, a beautiful little sage-green nest of old grass laid in a coil. I felt as pleased as if having a right to share the family happiness. After that I watched the small worker gather material with new interest, knowing where she was going to put it. She worked fast, but did not take the first thing she found, by any means. With a flit of the wing she went in nervous haste from cockle to cockle, looking eagerly about her. Jumping down to the ground, she picked up a bit of grass, threw it down dissatisfied, and turned away like a person looking for something. At last she lit on the side of a thistle, and tweaking out a fibre, flew with it to the nest. Range—Western United States from the Great Plains to the Pacific; south in winter to Western Mexico. Nest—In a bush or the lower limbs of trees, a few feet from the ground, of fine strips of bark, small twigs, grasses, and is lined with hair. 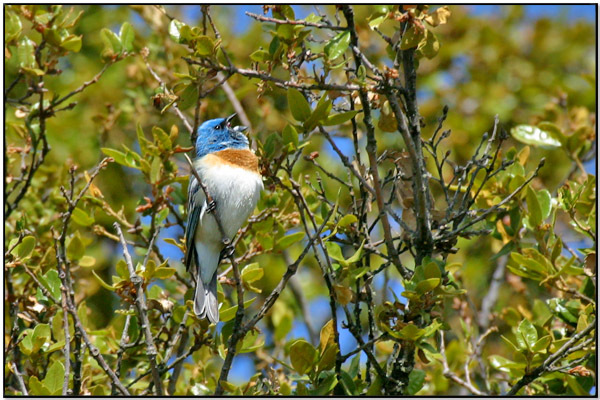 While the Eastern half of the United States has the Indigo Bunting, the Western half has their beautiful Lazuli Bunting. Both Buntings belong to the Cardinalidae – Grosbeaks, Saltators & Allies Family. The Lazuli Bunting is a North American songbird named for the gemstone lapis lazuli. After males are two years old, they develop their own individual song composed of a “series of different syllables.” The song is a high, rapid, strident warble, similar to that of the Indigo Bunting but longer and with less repetition. The male is easily recognized by its bright blue head and back (lighter than the closely related Indigo Bunting), its conspicuous white wingbars, (one wider than the other) and its light rusty breast and white belly. The color pattern may suggest the Eastern and Western Bluebirds, but the smaller size (13–14 cm or 5–5.5 inches long), wingbars, and short and conical bunting bill quickly distinguish it. The female is brown, grayer above and warmer underneath, told from the female Indigo Bunting by two thin and pale wingbars and other plumage details. Lazuli Buntings breed mostly west of the 100th meridian from southern Canada to northern Texas, central New Mexico and Arizona, and southern California. On the Pacific coast their breeding range extends south to extreme northwestern Baja California. They migrate to southeastern Arizona and Mexico. Their habitat is brushy areas and sometimes weedy pastures, generally well-watered, and sometimes in towns. 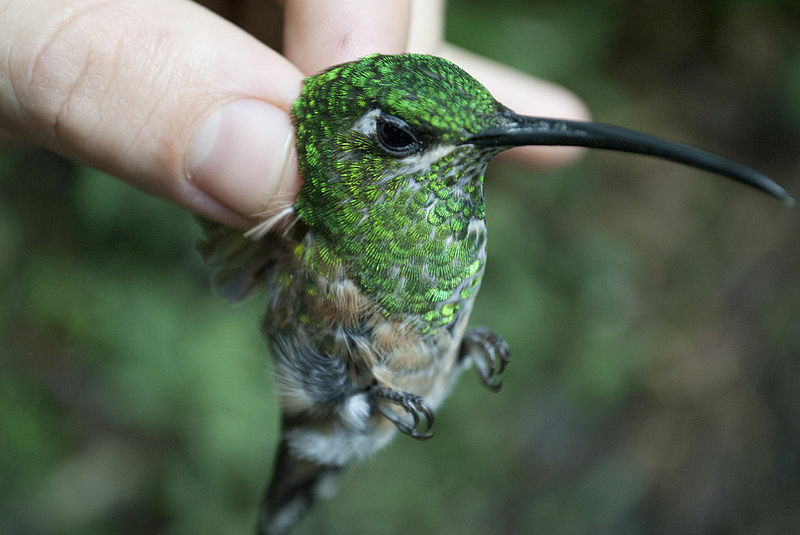 These birds eat mostly seeds and insects. They may feed conspicuously on the ground or in bushes, but singing males are often very elusive in treetops. This bird makes a loose cup nest of grasses and rootlets placed in a bush. It lays three or four pale blue eggs. In the eastern and southern part of its range, it often hybridizes with the Indigo Bunting. 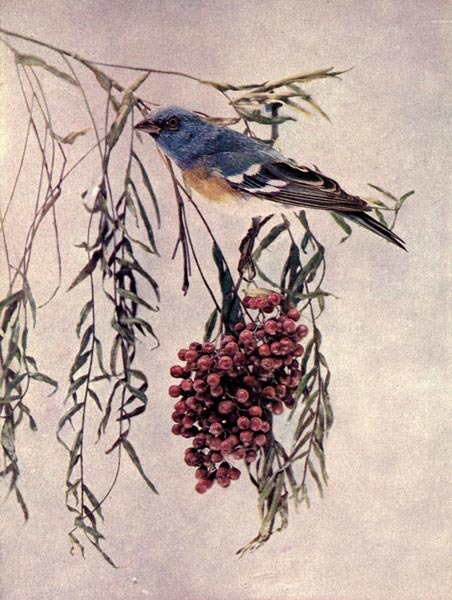 This entry was posted in Birds, Birdwatching, Christian, From The Past and tagged Birds Illustrated by Color Photography, Bunting, Cardinalidae, Home School, Kids, Lazuli Painted Finch, Photography, Vol 2 #5 Nov 1897, Youth. Bookmark the permalink.